Summary: The Driveway Patrol (TV3731) wireless driveway alarm is one of the most affordable alarms you can buy. However, quality is reflected in the price. The motion sensor is extremely unreliable and the unit breaks very easily. I recommend the Guardline GL2000 or the Dakota 2500 for a good driveway alarm. The Driveway Patrol (TV3731) detects people, animals and vehicles. The motion sensor will notify you when there’s any type of movement on your driveway. The Driveway Patrol alarm comes with 1 receiver, 1 motion sensor and mounting hardware. You’ll need to buy three C batteries and one 9V battery separately. The sensor will detect movement and it will send a signal to the receiver. When this happens, you will be notified by an adjustable chime. Even though it’s weatherproof, mount the motion sensor in an area protected by sun, heavy rain or wind. All these factors will have an impact on how well the sensor will detect movement. 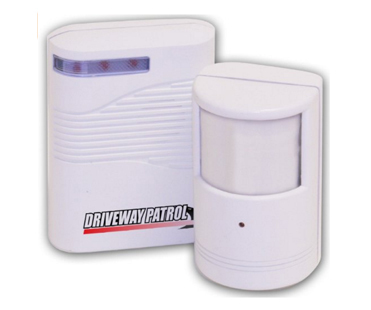 The Driveway Patrol (TV3731) is one of the most affordable driveway alarms on the market. It’s easy to install, but that’s about it. The sensor is very inaccurate: it goes off randomly or it does not detect people and vehicles when it should. It does not withstand cold weather and it will break if exposed to rain. The Guardline GL2000 is a good alarm that detects people and vehicles. The Dakota 2500 is my number one choice if you only need to get notified when a vehicle enters your driveway.